French and Italian Output Sag...for How Much Longer? 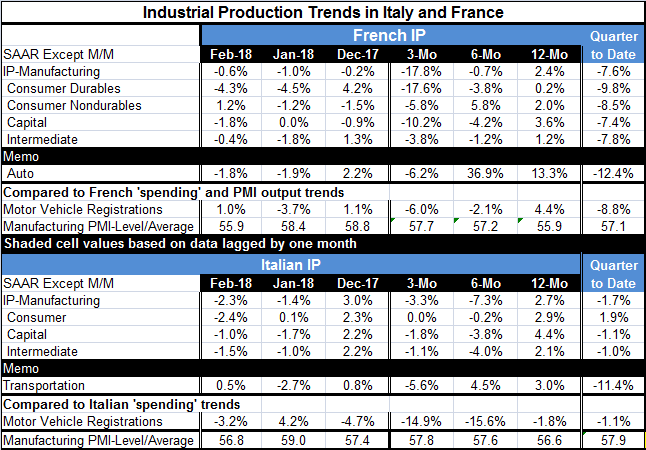 French and Italian manufacturing industrial production indexes have backed off in February. For Italy, it is two drops in a row; for France, it is four in a row. The PMI gauges have been weakening in Europe and we can see that the industrial sector is being accurately portrayed in some respects by the PMI weakness. For France, its manufacturing PMI reading over the last three months has averaged 57.7, which is a strong reading. Yet, on that three-month timeline, French manufacturing IP is falling at a 17.8% annual rate. This is why I say that the PMI gauges are good indicators ‘in some respects.’ They have the weakening right as the PMI gauges are softening, but in the lexicon of PMIs readings above 50 indicate expansion. For the last four months, the French PMI has been dead wrong in that respect. That is because the PMI gauges best track the year-over-year growth rates in terms of the PMI growth-rate-rules. While French IP is falling at a 17.8% annual rate over three months, it is also up by 2.4% year-on-year. The same is true of Italian IP vs. its PMI. Italian manufacturing IP is falling over three months and six months, but the three-month and six-month PMI averages are strong above a level of 57. As of February, Italian manufacturing IP is up by a solid yet modest 2.7% year-over-year. The French manufacturing PMI and IP movements are now sending out similar topological signals (see Chart on left). Both bottomed in 2016, advanced strongly through 2017 and have recently peaked and fallen off relatively sharply. The French PMI value is still relatively strong at 55.9 and the French IP gain is solid at 2.4% year-over-year. However, you can still see the exaggeration in the PMI signal in this cycle as manufacturing output on this two-scale chart usually was above the PMI level (Red>Blue) until 2016 and 2017 when the PMI mostly led and was stronger than IP. This is the sense of there having been a shift in the PMI to IP relationship that has made the PMI readings stronger than the counterpart IP readings in France. For Italy, the relationship between IP and the PMI seems more stable (See Chart on right). The manufacturing gauge has lagged below the blue PMI line for most periods. With a slightly opposite tilt is that Italian IP has closed the gap with its PMI recently indicating that IP in Italy may have been a bit stronger than the PMI gauge showed based on historic relationships. Still, the main point here is that PMIs are gauges not the real series we care about. While PMIs have some good and very topical information, they are not always the best guide or gauge to what is happening. Put another we way, PMI data must be interpreted with a good deal of perspective. Also we see that the movement in the PMI gauges may have more real topical information than the index levels since the levels are only really rationalized relative to 12-month growth. Turning more specifically to this month’s signals, we find French output PMIs and vehicle registration trends either falling or on the soft side. In Italy, output PMI and vehicle registration trends also are slipping. There is a clear loss of momentum. There has been this belief that the global economy was catching on, that recovery was spreading, or deepening, or even accelerating. Central banks have been preparing the way for a switch in policy focus and are in the process of removing the accommodative policies, instruments and programs that had been in place in the post-apocalyptic recovery. In fact, just yesterday we received some positive feedback on the outlook from Christine Lagarde, IMF Managing Director. While hopes spring eternal, hope has been outstripped by the reality of disappointment. It is also true that these have been winter months and there are odd weather patterns afoot and economic data can be wrong-footed by unseasonal or extra-seasonal weather. All is not lost. But I do think that the chaotic market behavior is a negative for the outlook. The threat of trade war is not a good thing either. And beyond that U.S. data had been ‘dressed up’ by hurricane replacement spending that is now mostly finished. There is still optimism about the impact of U.S. fiscal policy, but the consumer has been hard to jump start in this business cycle. And then there is the up-creep in oil prices and some clear weakening trends in Europe in addition to Asia having not been able to get out of its own slow-growth rut. All in all, I think it’s a good idea to put forecasts on hold here and to scale back optimism. There may yet be cause for celebration, but if your team is down at half time that is usually not a time to celebrate. Your hopes may remain high, but celebration is not in order. I think the same applies right here. I hope the Fed in the U.S. takes good stock of conditions before pushing ahead with its plan. The Fed has generally not had great luck with basing policy on its forecasts. That might change for a while this month as the inflation data could come much closer to being on target. Still, one swallow does not a summer make. Let’s hope that the central banks are prepared to swallow hard on plans already made. The policy environment calls for flexibility, not dogmatism.